Stomach Acid, PPIs and SIBO….what’s the link? I am always surprised that stomach acid is not addressed in many popular SIBO protocols. Many SIBO sufferers experience the uncomfortable stomach pain, heartburn and GERD that are the trademarks of stomach acid imbalance. If you go to a conventional doctor with these complaints, they will almost universally instruct you to take measures to lower stomach acid. They will tell you to avoid acidic foods and/or take a PPI/acid blocker. (PPI stands for Proton Pump Inhibitor). Not only do these acid lowering recommendations devalue the critical importance of stomach acid for the proper digestion and absorption of our food, but they also are likely throwing fuel on the underlying problem. Usually when an individual is experiencing chronic gastritis, GERD, heartburn, ulcers or stomach pain, they are deficient in stomach acid. As we age, our stomach acid naturally starts to decline (See chart below). That’s why when you hit a certain age, you are forced to realize that you cannot slam chili dogs like you used to in your college days without experiencing heartburn and reflux. By popping a TUM’s after a large meal, most people are only further reducing their already low stomach acid levels. The advertisements and even doctors empty promises of a quick fix for heartburn through PPI and antacid use can have severe and long term consequences while completely missing the true source of the problem! To quote Phoebe from Friends….STOP THE MADNESS! So why do we need stomach acid anyway? Stomach acid is your friend!! It is so crucial to not only the digestion within the stomach, but it also sets the stage for digestive processes downstream. The gastrointestinal tract is extremely pH sensitive, which means that every part of the GI tract has to a specific acidity or alkalinity in order to function correctly. In the stomach, the release of hydrochloric acid triggers the release of an enzyme called pepsin, which is essential for the digestion of proteins that we eat. Certain mineral absorption also seems to be quite dependent on adequate acid levels in the stomach including zinc, magnesium, copper, selenium and iron. This stomach acid is also present to protect us from harmful bacteria that we ingest that are in our food and in the air we breathe. Most pathogens cannot survive in the harsh acidity of the stomach. While protein digestion and pathogen protection are the more widely discussed roles of stomach acid, the downstream importance of having adequate stomach acid isn’t highlighted as often. Continued digestion and absorption is highly dependent on the acidity of the chyme (food blob) as it exits the stomach. The chyme has a pH of 2 as it exits the stomach into the duodenum of the small intestine. The high acidity triggers the hormone CCK to be released. CCK is responsible for stimulating the release of bile and digestive enzymes. If you don’t have acidic chyme, enzyme and bile release will be hindered. Therefore, you won’t absorb or digest your food properly, leaving your body hungry for nutrients and your intestines susceptible to overgrowths and inflammation. Bile secretion not only helps you emulsify dietary fats, but it also acts as an antimicrobial to prevent bacterial overgrowths in the small intestine. In fact, patients who have liver cirrhosis or bile ligation often develop SIBO. As I have highlighted above, your stomach needs to be acidic in order to digest and absorb nutrients and to protect us from pathogens. Long term PPI use has been associated with increased infection, nutrient deficiencies, heart disease, chronic kidney disease, dementia and of course SIBO. PPI use can be the root cause of many SIBO cases. This particular study found that PPI users have a higher incidence of SIBO compared to both individuals with IBS and healthy controls. The researchers also found that the prevalence of SIBO greatly increases if PPI therapy is used for 13 months or longer. The correlation between SIBO and PPI seems to have two potential causes. First, long term PPI use can cause SIBO by disturbing the pH balance and the function of the digestive system as a whole. This perturbation creates an environment in the GI tract that is susceptible to bacterial overgrowths (as I previously discussed above). Second, I believe some individual’s GERD is due to the abdominal pressure created from SIBO. In this case, the doctors are diagnosing based on the symptom and failing to see the root of the problem. Many individuals with stomach pain and gastritis who take PPIs/antacids could also be suffering from an H. Pylori infection. H. Pylori is the bacteria that is responsible for ulcers and it thrives in stomachs with low acid. These wee beasties make ammonia that not only causes ulcers, but it also lowers the acidity of the stomach. PPIs have been shown to increase the colonization and worsen gastritis in the presence of an H. Pylori infection. So, while PPIs may help with the symptoms, they can also exacerbate the infections causing the problem and also leave the individual susceptible to SIBO further downstream. The pH changes from PPIs don’t only effect the stomach and the small intestine, but they also seem to be detrimental to the health of your colonic bacteria. PPIs have been associated with decreased bacterial diversity in the colon as well as an increased risk for pathogenic infections in the large intestine like E. Coli. PPIs can often become very hard to discontinue. I always think of that song from the Little Mermaid “Poor Unfortunate Souls” when I think of the brave individuals trying to discontinue their PPI after long term use. Once you cut the ties with that Nexium, your symptoms seem to surge back worse than ever. I was actually on a PPI for about 4 months when I was 19 and I had a terrible time trying to discontinue it. Every time I tried to stop it, my symptoms would rush back with a vengeance. Eventually, I was able to weather the storm, but it certainly was a painful and difficult process. I can’t even imagine what the process would be like for someone who has been on PPIs for years. The rebounding of symptoms post PPI is a result of the drug changing the physiology of the stomach. The mechanisms that regulate stomach acid levels get all messed up. When stomach acid levels start to decrease from the PPI, your body increases secretion of the hormone gastrin. This increased gastrin leads to an increase in the number of ECL cells that stimulate growth of parietal cells, which are responsible for producing stomach acid. The bigger the parietal cells the greater the quantity of stomach acid. Your body is essentially adapting to the inhibiting effects of the PPI by growing parietal cells in a desperate attempt to produce more stomach acid. Once the PPI is stopped, the flood gates are down and the massive parietal cells overcompensate by secreting too much stomach acid. This study found that this over secretion even occurs in relatively short stints of PPI use with study participants exhibiting rebound symptoms after only 8 weeks of PPI use. The nasty symptoms that can accompany this hyper secretion of stomach acid lead many to hop right back on the PPI train. How do you know if you have low stomach acid? I have struggled with low stomach acid and I feel like the biggest symptom for me was that I couldn’t tolerate meat. Every time I would eat meat, it felt like I swallowed a brick and that brick just sits there! It is an awfully uncomfortable feeling. Reflux after meals is also a big symptom of low stomach acid. Most people including doctors attribute this to too much stomach acid, but low stomach acid mimics the symptoms of high stomach acid. When acid is low, food can ferment in the stomach which creates carbon dioxide that pushes the cardiac sphincter of the stomach open and allows the little acid in the stomach you do have to exit into the esophagus. The esophagus doesn’t contain mucous that the stomach does, so it does not have a buffer to prevent irritation from the acid. This produces irritation in the esophagus that is textbook in patients with GERD. Beyond the symptoms, there are more diagnostic ways that you can test your stomach acid levels. I think perhaps the newest and best way to test for pH levels in the GI tract is to swallow a SmartPill. SmartPill is an ingestible capsule that measures pressure, pH and temperature as it travels through the gastrointestinal tract to assess GI motility. This pill is really cool, but the bad news is that because it is so new many doctors are not using it. But if you are worried about your stomach acid levels, I would definitely consider asking your doctor about this pill. There is also a cheap at home testing method that involves drinking a solution of baking soda and timing how long it takes you to belch. The longer it takes you to belch the greater your stomach acid deficiency is. While this test is simple and cheap, I am not 100% sure of its accuracy. But, it is completely safe and worth a shot. Here are instructions on how to conduct this test. I personally find these simple additions to be the gentlest way to increase stomach acid levels and improve digestion as a whole. I find that a TBSP of ACV with about 4 ounces of water about 2o minutes before my meal is what works best for me. People with sensitivities to fermented foods or citrus may want to find a different method for increasing stomach acid. Betaine BCL might be a better option for people with histamine issues or sensitivities to citrus. But, I am not an advocate of the HCL challenge test. If you take HCL and experience burning you are irritating the epithelial layer of the stomach, because you don’t have a thick enough mucous layer to protect your stomach lining. In this case, you may benefit from first building a stronger mucosal layer and then taking measures to increase your stomach acid levels. If you have been diagnosed with ulcers or gastritis by your doctor, treat any underlying infections like H. Pylori and then work on healing the gut lining through dietary and supplemental measures. Zinc Carnosine has been shown in various Japanese studies to heal gastric ulcers without impacting stomach acid levels like PPIs. A study in the British Medical Journal demonstrated that DGL (deglycyrrhizinated licorice) was as effective at healing ulcers as over the counter options like PPIs. L Glutamine is also a good option for healing the gut lining. Digestion starts with the senses, so take some time to really take nice big whiffs of your food in order to stimulate both salivary enzymes and stomach acid. I used to just scarf my food down in like 2 bites and my poor belly did not thank me. This advice isn’t just for people with low stomach acid, but all people can benefit from the better absorption and easier digestion when food is chewed thoroughly. 6. Avoid drinking large amounts of fluids before, during and after meals. Liquids dilute stomach acid making it less effective. I find that if I drink more than 4 ounces of water at a meal, my digestion suffers. If you are a big time meal drinker, try this out! You will definitely notice a difference. That’s all I got this week! To stay updated about all my posts, you can like my Facebook page by following this link. 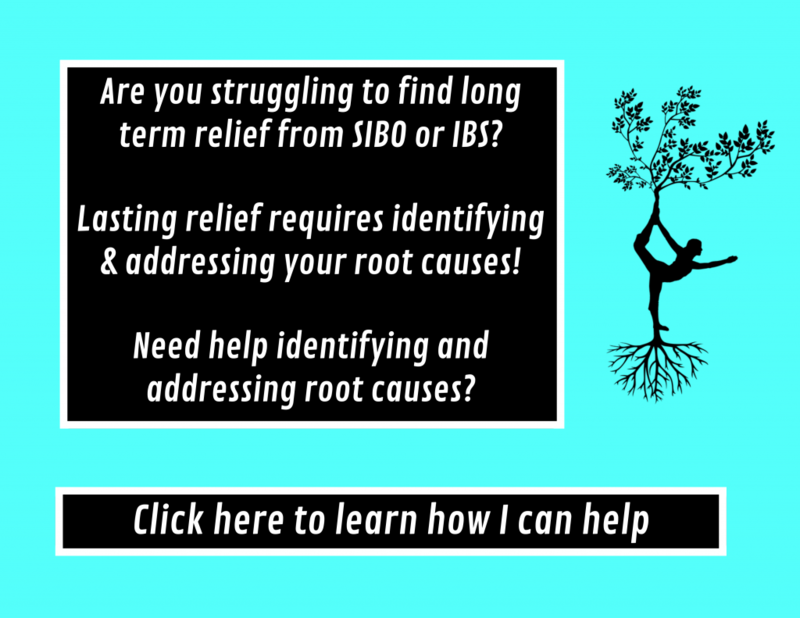 Are your SIBO symptoms holding you back? I can help! Contact me about scheduling a free 20 minute consult! Previous Previous post: Antibiotics for SIBO….Helpful or Harmful? Hi Joe! Thanks for your comment. There doesn’t seem to be any new studies on DGL and you are correct that the research seems to be mixed about DGL. Some show no benefit vs. placebo while the British Medical Journal I referenced shows that it is as good as PPIs in treating ulcers. It has been shown to be protective against mucosal damage from aspirin (http://www.ncbi.nlm.nih.gov/pubmed/493863). So, maybe DGL isn’t going to heal your ulcers, but could be protective against further damage? I have not researched this extensively so this is just theoretical. On the last point, what about having 4-6 oz. of wine with a meal? Do you have experience with that at all? I know there is a tendency for SIBO sufferers to avoid sugar like the plague (no juice, no alcohol, no desserts, etc, because who knows if they have SIBO or candida?). The madness never ends. I have a question about that subject and I hope I get an answer. I know that PPI’s causes Hypoclorhydria(Low stomach acid), but you say that it causes excessive secretion of stomach acid. Which is a little bit confusing?! which one is right? Hi Eslam! It can definitely be confusing. Please let me clarify. When you are on the PPIs, you will have low stomach acid. But when you go off of them, it can cause a surge of stomach acid. The inhibition from the PPIs is removed and the stomach acid flood gates open. I hope that clears up the confusion! My doctor has tested me for SIBO today. He did not give me Lactulose nor Glucose. I blew up once. Just once. He did not tell me to follow a preparation diet. Just stop taking Proton Pump Inhibitors. He said I should fast for 7 hours. all that I ate the day before the test was fried chicken and eggs. The result of the test was 4 ppm. He said that I have Bacterial Overgrowth but not too much. when I asked him about the ten tubes test and the Lactulose and Glocuse that I hadn’t had. He said this kind of test and those bills are for people who suffer from malabsorption and not for me. The device he used showed the result immediately. This is the device he used. What can you tell from this scenario?